QUESTION: In a recent interview you mentioned some projects you were working on. Four actually. “Sweaterweather,” a book about a donkey shoemaker, a book about a dog and his bird friend who get caught in a rainstorm and a book called “Darwinia.” Can you describe how you work on multiple projects at once? For example are you plotting one while you’re writing another while you’re drawing a third? Do you focus on just one at a time? How’s does your work work? Hello, Rafael/Jorge! Well, I think that’s a pretty misleading interview, because it sounds like I just whipped those projects out, but really those are things that I’ve been working on for many years. And, with the exception of Sweaterweather, which is due out in Fall 2016, most of them won’t be out for many more years. I’m usually not working on multiple projects at exactly the same time. I had to do that recently because I had two books due at once, and it’s really hard to switch gears. For me, books usually happen in stages. If I break it down, I’d say there are 3 stages for me: (1) selling a proposal, (2) thumbnailing a book, and (3) revising and then doing finals. There’s usually a huge amount of time in between those things, but this time is important because it lets the ideas stew, which is an important part of the process. So, say, I’ll sell the proposal, and then I’ll put it aside for awhile. A long time will pass and I’ll do something else and then I’ll come back to those thumbnails. If I’m doing thumbnails for one thing, I am not doing anything else. It can take a long time to get editorial feedback, so I’ll do something else in the meantime. For instance, for the donkey book, which I hope to focus on next, I sold the project about 5 years ago. Over 2 or 3 years, I did some research at my leisure. And then I did the thumbnails in 2013-2014; it took me about 6 months. I turned them in around Spring of 2014. Then some other projects came along. I redesigned Sweaterweather in that time (it was different than most projects because it started out with pre-existing material, so it was relatively quick.) And I illustrated a picture book that I did not write for Chronicle, both of which are in the finishing stages. I am supposed to get editorial feedback on the donkey book this month, and then I hope to only work on that until it’s done because it’s the project I’m most excited about. I hope editorial revisions don’t take too long, and then I’m expecting finals to take 15 months, if I can do 3 final pages/week. When that’s done, I’ll come back to the Darwinia project or the picture book about the rain. 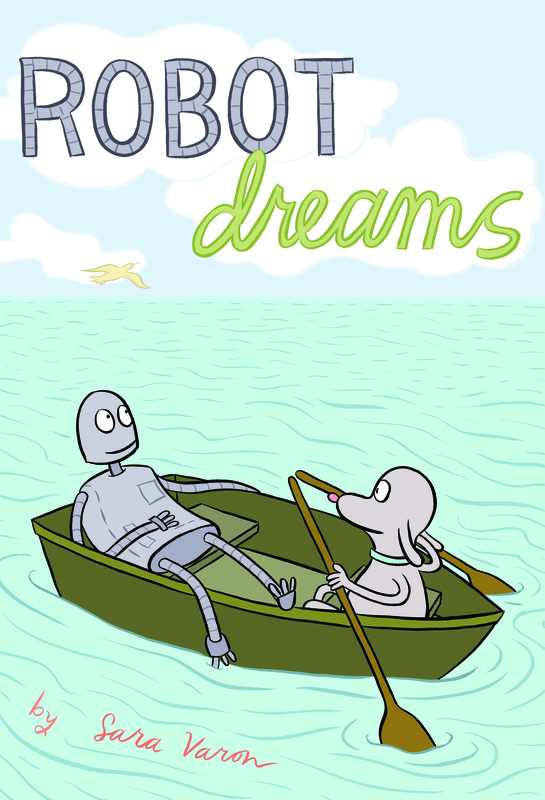 QUESTION (FROM JORGE): As I mentioned my boys were obsessed – as was I – with the dog and robot in “Robot Dreams.” Any chances you’ll go back to that world again and check in on them with a new story? Oh, thanks! Sorry to tell you that I won’t. Once I run through an idea, I don’t come back to it; I’m not really interested in it anymore. I know some artists work with the same characters over a very long time or maybe even their lives, but I’m not that kind of artist. QUESTION: Can you tell us a little bit about how the script to “Robot Dreams,” or “Bake Sale” which you wrote, was different from the script for “Odd Duck,” which you didn’t write. In each case, what did you have in front of you when you sat down to draw? 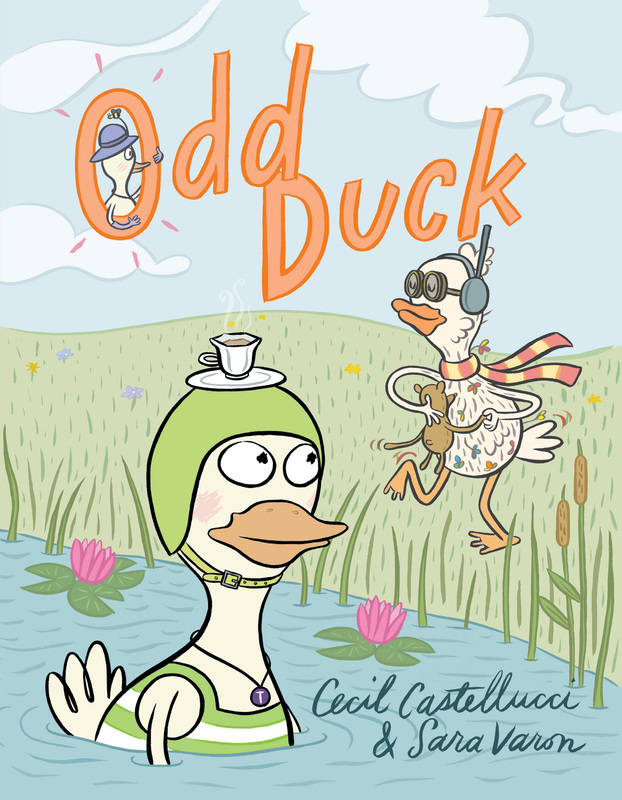 Working on ‘Odd Duck’ was great. Cecil is a great writer, so I learned a lot about constructing a story from working on that book, since I have very little formal education when it comes to writing. If I’m writing my own project, I start with the proposal. The proposal is usually a page or two, and it says ‘this will happen, this will happen, and that will happen.’ It’s a list of events in the approximate order that they will occur in the story, and it’s never gracefully written. The resolution is usually open-ended. From there, I think about it in the back of my mind for a very long time (as I mentioned in your first answer.) I do a lot of running, and I find that this is a great time to think about stories and details. I usually run in Prospect Park, which is really convenient because I don’t have to worry about crossing streets, getting lost, or getting run over by cars. (It’s just a big loop with no car traffic.) So I can really lose myself in thought. When it comes to thumbnailing, I look at my outline, and I just fill in the gaps, like, how does the character get from one item on my list to the next? Thumbnailing is the hardest part, cause I really have to squeeze the ideas out, but something I like is that surprising details often emerge in the story. For instance, when I begin, I don’t know how the story will end, so I don’t find out until I’m actually drawing it. With Cecil’s project, I received a complete story. It was about 5 or 6 pages in Microsoft Word, and it was fully realized. I sat down with it and broke it into pages. I think I originally made it 64 pages, and it got edited up to 96. What’s really important with story-telling is the pacing, so I put in some pages with no words. Silence is an important part of a picture-story. It gives you a little time to think about the thing that just happened, or maybe to savor it. Also, something a teacher once told me is that in illustration, it’s important that the pictures are not just repeating the words, so when you get a manuscript from someone else, you have to figure out what details you can insert to emphasize the ideas in the story. QUESTION: What’s the first comic book you ever read? Or the most influential? I did not read comics growing up because I was only aware of superhero comics which did not appeal to me – it was all boy-stuff and a lot of gender stereotypes that were a real turn off. 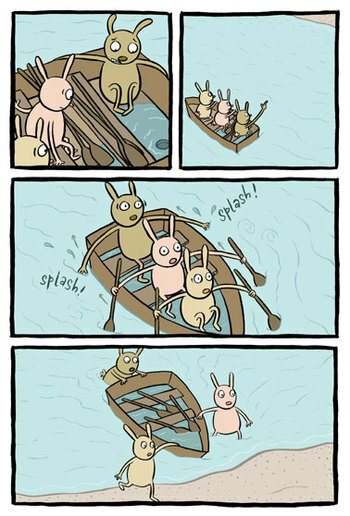 The first comic I saw where I thought, ‘Wow, comics can be like THIS? !’ was ‘Goodbye Chunky Rice,’ by Craig Thompson. 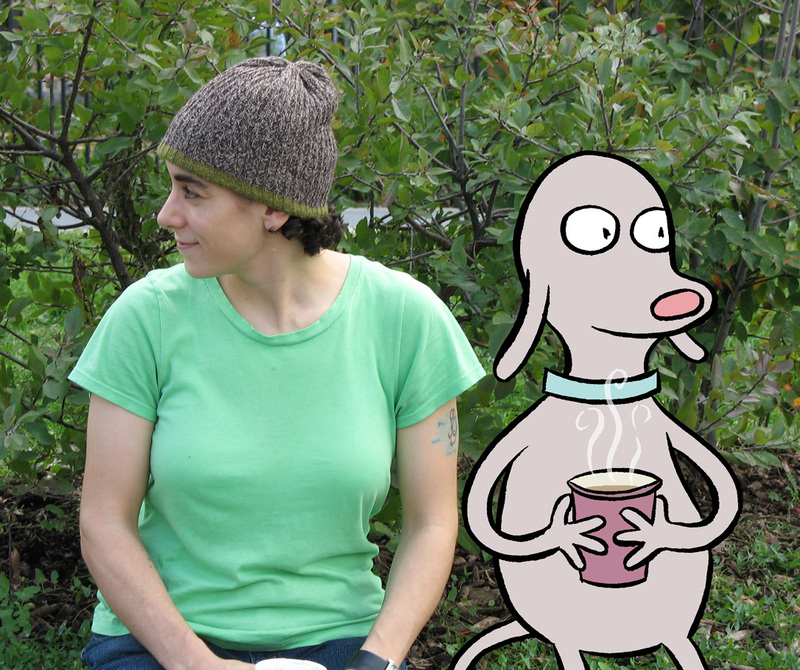 Around that time too, there was a small publisher called Highwater Books that made beautiful books about things that were more relevant to me, and seeing those was really eye-opening – those books made me interested in reading and making comics. QUESTION: What’s on your nightstand? Well, I always have a long list of book requests from the New York Public Library. (The library is pretty much one of my best friends.) Somewhat inconveniently, I just received a slew of books at once (it’s best when they arrive one at a time,) and here’s what I’ve got right now. Sadly, I will not get through all these books before they are due, cause I’m not that fast a reader. Pingback: 5 Questions – Week 4 « GIANTS BEWARE! DRAGONS BEWARE!